UPDATE 2/7: Service has been restored and our phones are working again. Strawberry staff can be reached by phone M-F, 9-5 at (209) 984-8630. Thank you for your patience while our phones were not working, and our office was closed, this week due to winter weather. The office is currently experiencing a phone service interruption that is expected to last from February 4th – 6th. 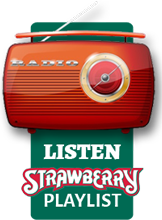 In the meantime, you can still reach us at info@strawberrymusic.com. 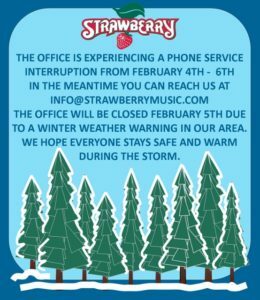 Additionally, the Strawberry office will be closed on Tuesday, February 5th, due to a winter storm warning in our area. We hope everyone stays safe and warm during the storm. Early bird tickets to the Spring Festival are available now from the Strawberry’s online store.